Original Antique Maps and Prints. Rare Antique Print-SOUTH AFRICA-CAPE OF GOOD HOPE-CAPETOWN-VOC-Van der Aa-1725. Description: This plate originates from the very scarse:'La galerie agreable du monde... Van der Aa, Leyden, c. This famous work was published in 66 parts and is the biggest print / map book ever published. Van der Aa incorporated plates by other publishers such as Blaeu, Visscher, de Wit, meurs, Halma, Mortier, Allard in this work and often added broad decorative borders. Probably the costliest and complete universal geographic work ever produced. It is said that only 100 copies were printed. Ref: Koeman Aa9; Phillips 2780 note. This plate is a re-freshed and partially re-engraved and altered plate first published in'Naukeurige Beschrijvingen der Afrikaensche gewesten... , and'Naukeurige beschrijvinge der Afrikaensche eylanden... , by Olfert Dapper (1639 - 1689). The Galerie Agreable contains plates and maps by the best Dutch engravers: Luiken, Goeree, Mulder, Stoopendaal, Aldert Meijer, Romeyn de Hooghe, ao. 'Cap de Bonne-Esperance en Afrique'. The Cape of Good Hope in Africa. This plate shows a view of Gape of Good Hope with Capetown, the Dutch VOC fortress and ships in the bay. The key furthermore identifies the Tafel Berg, the Roadstead, a fort ect. Extremely rare in this edition. Condition: Size (in cm): The overall size is ca. The image size is ca. 33.5 x 24 cm. Size (in inch): The overall size is ca. 19.3 x 15 inch. 13.2 x 9.4 inch. Medium: Copperplate engraving on a verge type hand laid paper with watermark. ThePrintsCollector Peter Cornelissen, Margo van Latum - van Dongen, Frank van Latum Zeeland - The Netherlands. We guarantee our items to be genuine original. GO TO OUR STORE and explore our huge collection of fine antique maps and prints. FIND SIMILAR ITEMS IN OUR STORE. Visit our Store: we would like to invite you to review similar items in our Store or to browse through all other items in our Store. We are confident that you will find very special unique antique maps and prints in our Store. It is our privilege to have you as a customer. 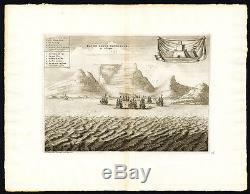 The item "Rare Antique Print-SOUTH AFRICA-CAPE OF GOOD HOPE-CAPETOWN-VOC-Van der Aa-1725" is in sale since Thursday, October 29, 2015. This item is in the category "Art\Art Prints". The seller is "theprintscollectoruk" and is located in Zeeland.